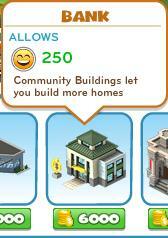 Two new Community Buildings have arrived in Cityville: the Zynga Gazette and the Bank. Like all Community Buildings, both will increase your population cap and, unfortunately, both require you to fill several staff positions with friends. The Bank, which is open to players Level 13 and above, goes for 6,000 coins and raises your population cap by 250. The Zynga Gazette on the other hand unlocks after Level 23, costs 18,000 coins and increases your total available population by 450. We find it odd that the Zynga Gazette wasn't pegged as the target for any future Goals. Just imagine the possibilities. I mean, how many super hero news reporters are there? Or how about a muckraking media scandal involving you, the mayor? Oh well, maybe our cities will get their own super heroes another day. Until then, at least we have some new buildings to put up. Have you bought these new Community Buildings yet? 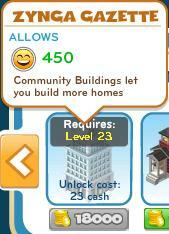 What new types of Community Buildings or Goals would you like to see in CityVille? Sound off in the comments. Add Comment.